If you travel into the city centre today you will notice there is a real buzz in the air. Thanks to the efforts of Wild in Art in conjunction with Manchester City Council and over a hundred sponsors, we can all enjoy one of the most spectacular public art events the city has ever seen – Bee in the City. From 23 July until 23 September over 100 Bees are waiting to be discovered on this free and family-fun trail, taking in the city’s landmarks and undiscovered gems. Each Bee has been designed by a different artist and celebrates the unique buzz of Manchester, from its industrial heritage to its vibrant music scene. Manchester Branch along with North West UNISON are proud to sponsor our very own Bee for this event. Her name is Sylvia and she was designed by the brilliant Sneaky Raccoon. 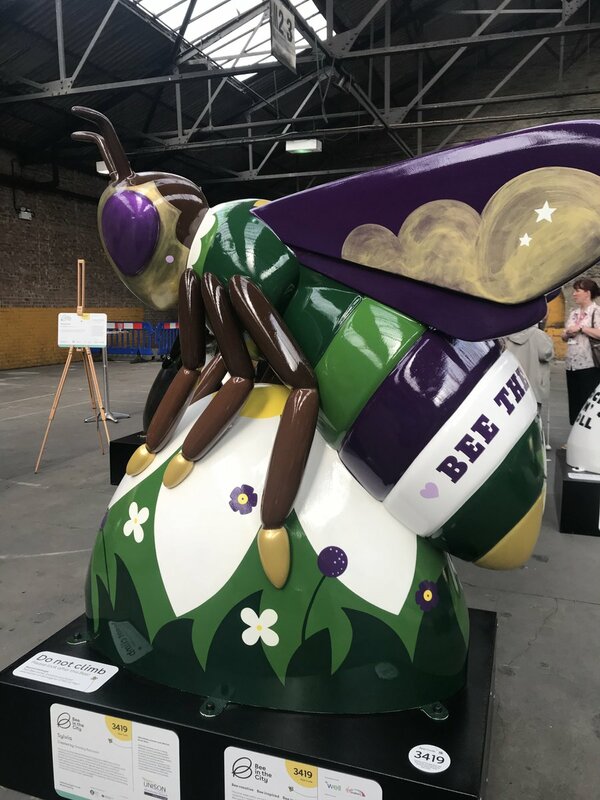 We have included some photos of her below and she is Bee number 41 on the official Bee in the City Trail Map, located inside the People’s History Museum at Spinningfields. Please come along to say hello and take the time to explore this fantastic museum on the history of working-class life. Entry is completely free and donations are gratefully received.